Winning strategies aren’t built in a moment of inspiration—they require careful design, constant reassessment in the context of market change, and a commitment to flawless execution across the organization. 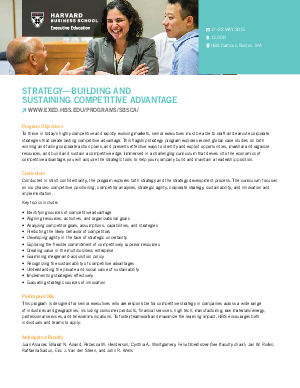 At Harvard Business School, you can learn how to develop successful, groundbreaking strategies that help you beat the competition. Our Executive Education program Strategy: Building and Sustaining Competitive Advantage delivers the latest strategy research, proven strategy development frameworks, insight from strategy innovators, and the opportunity to exchange ideas with seasoned executives from around the globe.